Figure 8.1. This example shows two TouchSensors, the door on the left is activated on a button-down (isActive true) event. 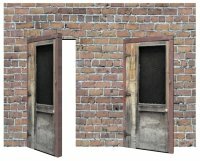 The door on the right is opened on a button-up (touchTime) event. Figure 8.2. 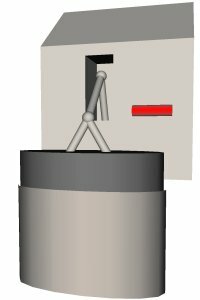 This example (TouchSensor.x3d) shows the pump house, which is activated when the button is pressed down while the cursor is over the pump house. Figure 8.3. A PlaneSensor is indicated by the red bar. The sensor output controls the amplitude of the pump. Figure 8.4. 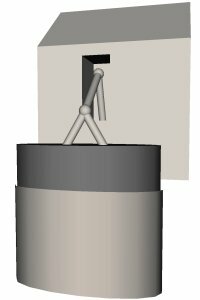 Shows how the diskAngle field determines whether a user�s drag motion produces a rotation that is either in end-cap disk mode or cylinder-walls rotation mode. Figure 8.5. The position of the CylinderSensor is indicated by the red knob and pointer. Rotating the knob changes the user�s viewing angle. Figure 8.6. Setting a CylinderSensor�s axis of rotation to be different from sensed geometry is best accomplished by using the design pattern shown in this scene graph. Figure 8.7. 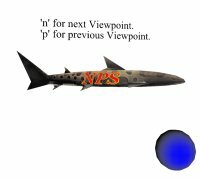 The orientation NPS shark is manipulated with a SphereSensor on the blue sphere. Figure 8.8. 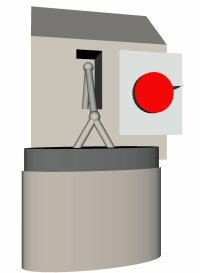 The KeySensor example allows the user to change the viewpoint. Figure 8.9. A StringSensor allows the entry of the string "X3D: Extensible 3D Graphics!" into this X3D world.